Over the years, engineers have found ways to cram more and more transistors onto a single integrated circuit. As a result, they have been able to pack more computing power into smaller machines. The Department of Energy recently presented an Early Career Research Award to Fermilab scientist Tengming Shen, an engineer working to spur the next magnet revolution. DOE awarded Shen $500,000 per year for five years for his research into engineering high-field superconducting materials for advanced accelerator technology. If his team succeeds, the work could pave the way for the construction of high-field superconducting magnets for future accelerators such as Fermilab’s proposed muon collider, for energy upgrades of the Large Hadron Collider and for the development of new medical imaging devices. Shen’s strategy is to search for a better magnet-making material. Scientists currently use two niobium-based materials, NbTi and Nb3Sn. “You have to go into a territory that’s new,” he said. Fermilab’s Tevatron was the first particle accelerator to use niobium-titanium superconducting magnets. Before superconducting magnets, scientists had used iron or copper magnets, which required large amounts of electricity and, when used with insufficient cooling, tended to melt. Scientists cooled magnets in the Tevatron with liquid helium; they reached a magnetic field strength of 4.3 Tesla. The scientists who built the Large Hadron Collider cooled their magnets with superfluid liquid helium, reaching even colder temperatures, and almost doubled that performance to 8.3 Tesla. Fermilab and other U.S. laboratories have recently developed new technology using niobium-tin, Nb3Sn, which scientists hope will help them make the jump to 12-13 Tesla magnets. The next step, according to Shen, is to push the limit of superconducting magnet technology by exploring new materials beyond the niobium family. This would allow scientists to more than double the energy reach of the LHC without increasing the size of the accelerator, he said. 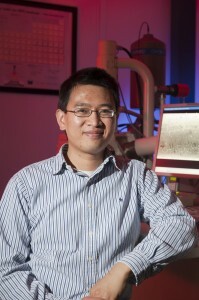 Shen plans to study a group of high-field superconductors, in particular Bi2Sr2CaCu2Ox. He expects he could use this material to build magnets with a reach of up to 50 Tesla.